Although it's usual to have an Internet connection to allow us to play videos online on sites of the likes of YouTube or Facebook, on some occasions we might want to download them to our computer for one reason or another. Maybe because we want to extract the audio, because we want to use them in a video editing program or simply because we're traveling somewhere without an Internet connection. 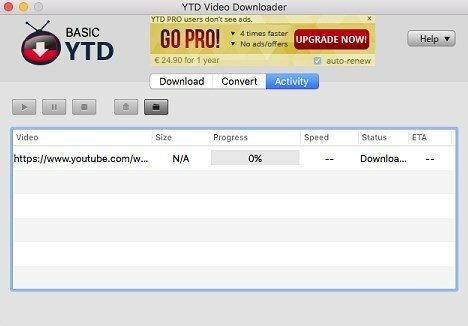 Whether due to these reasons or others, a program of the likes of YTD Video Downloader can make things much easier for us: on the one hand, it allows us to download videos to our Mac, and on the other, we can use it to convert the video to a compatible format. Download videos in high definition with resolutions of up to 1080p. Easy-to-use interface: just past the URL and click to download. Video conversion: convert the video the format of your choice just in case you want to play it on another computer or mobile device and you want to guarantee its compatibility. Classify and organize your videos and create playlists. Take your videos with you wherever you go with YTD. YouTube, Facebook, Vimeo, BBC.com, Bing, LiveLeak... this software is compatible with the main video streaming sites, including webs with adult contents. That's probably cheered up your day.